These are hearty pancakes. Chuck Norris pancakes. Navy Seal pancakes. They're also the favorite food of my baby boy. Because, well, they are pancakes after all. We had a brunch for my son's first birthday that started with a hefty stack these and two quiches, and ended with that Sugar-Free Banana Cake I posted a while back. The recipe is loosely adapted from one in the More-With-Less Cookbook and is endlessly versatile. Don't have yogurt? Use buttermilk, milk + 1 T. vinegar, or kefir. 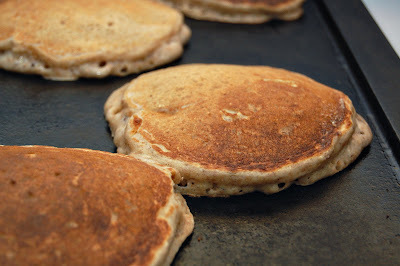 Don't have oat flour? Go ahead and use all whole wheat or AP, or even soy flour and wheat germ. I know I should have my hand slapped for posting an apple recipe in May. I'm sorry. I really am. You'll forgive me sometime in between pouring the batter on the griddle and licking the syrup off your plate. Cook on a lightly greased skillet or griddle over medium heat. Serve warm with syrup, peanut butter, or vanilla yogurt and applesauce. Leftovers freeze & reheat well in the toaster. Please excuse the dreary picture. The sun has forsaken us this week.